Yes, it's time once again for Eric to don his sarcastic hat, and make comments about something he's seen in the Tri-State that just doesn't make sense. This time it's what I've been looking out my studio window and seeing for the last two weeks. The Hilliard Lyons building on the corner of Main and 4th is being cleaned out to make way for something...that's what this sleuth has gathered. What still alludes me is the reasoning for this flying dumpster. 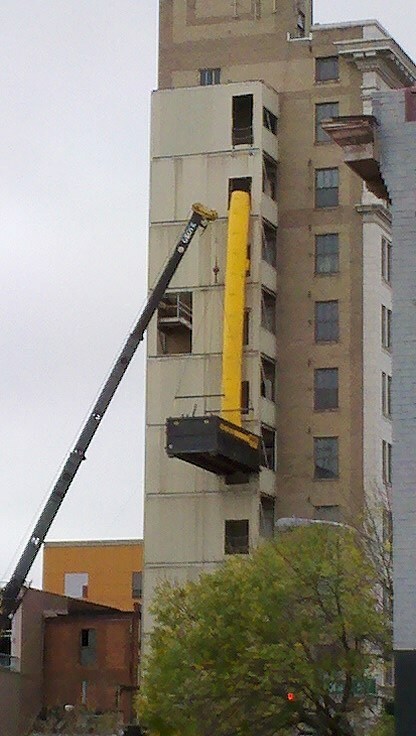 We've all seen this before; the bright yellow tubing coming out of the building to form a makeshift trash chute. But here we see the tubing stop short of the ground and a crane lifting a dumpster to the end of the tube while trash is dumped out of the upper floors. Now, maybe it's just me, but it seems this project would be more cost efficient by ordering more yellow tubing and cutting out the cost of the crane rental. I even tried to give them the benefit of the doubt by checking to see if something was blocking the dumpster being left on the ground. There was...ANOTHER DUMPSTER! Well, who am I to deprive someone from playing with a shiny new crane? Play away, and continue to confuse me folks. When the boss man says, "we need to cut costs," you give ol' Eric a call. I've got an idea.